With the arrival of Baby Gastro on the immediate horizon (3 days! ), my plan was to lock myself in the home office this past weekend to tie up any loose ends hanging over my head from the 9-5. Instead, I sort of went to Rice's Quality Meats in the Chestnut Hill Farmers Market and sort of bought a pork shoulder. And then, I sort of had to make a dry rub and sort of had to keep an eye on it for 4 hours, which--when you figure in sitting down to dinner--left little to no time for the loose ends. A big oops, but procrastination is sure delicious sometimes. Buen provecho. 1. Start gas grill, using burners only on one side to achieve a heat of 250 to 300 degrees. Put a couple of handfuls of wood chips in a tinfoil pan, and set it over working burners. 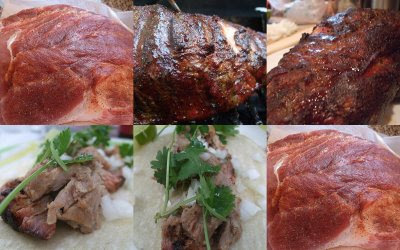 While grill heats, mix together dry ingredients, and rub them all over pork, including under skin as best you can and in any crevices. 2. Put pork on cool side of grill and cover. Check about 15 minutes later to make sure chips are smoking and heat is below 300 degrees. Check every hour or so in case heat escalates too much or chips need replenishing. 3. Pork is done when it reaches an internal temperature of about 190 degrees, about 4 hours later (less time if you used a smaller piece of pork, more if larger). Meat will be very tender. If you like, raise heat and grill meat to crisp it up a bit. Serve immediately. mmmmmmmm-mmmmmmm, FiGas! no flames or fire extinguishers?